I love the way these three sided vases look two dimensional when you are viewing only one face. This is a pattern I first saw in India, although it is also used in Andalusia and is found across the Islamic world. 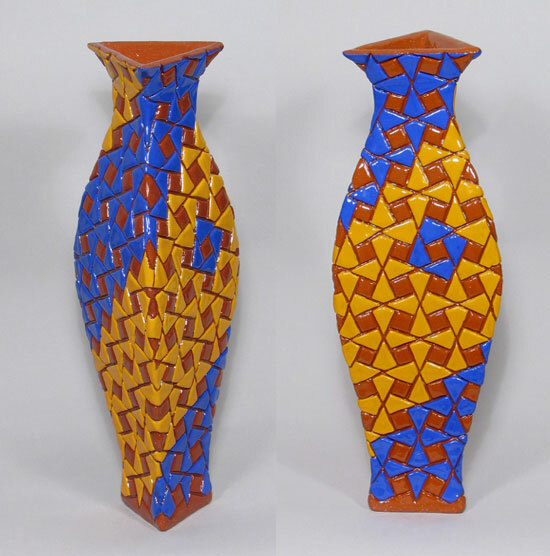 Unlike the platters, many of my vases use traditional patterns which I wrap around my forms. I use dental tools to clean up the lines and I tweak the pattern a little to get it to connect on the edges. The inspiration for these vase shapes actually came from Chinese Bronzes, which I studied when I was in college. These vases look great with flowers in them! Terracotta tends to sweat when it is filled with water. Use a coaster underneath to protect your furniture if you are placing a vase on a wooden surface.